I’ve told you about my Blueberry Bagel obsession. I’ve been in to every bagel shop I’ve passed by without finding any and even when my friend brought me to “reliable” Tompkins Square Bagels I walked away with blueberry creme cheese (NOT what I was looking for). Davids Bagels, which was my second “I KNOW they have blueberry bagels”-place, made me disappointed as well. So I more or less gave up. I heard about another place in Brooklyn so I did consider to go there (and I should since I’ve never been in Williamsburg) but when I googled it I found Bagel Express (25th street, 3rd ave), which was only 2 streets from where I live. Went there this morning with no expectations and OF COURSE they had my delicious, sought after bagel! To clarify – I pass this place at least 2 times EVERY day! How could I have missed it?! It would have been the perfect breakfast (and will be my last 3 days)! Well, enough with the pity and more about the food. This place had more varieties of Creme Cheese than I can count to. There was avocado cilantro, jalapeno, apple cinnamon etc etc. I chose an open faced blueberry bagel with half plain creme cheese and half banana nuts creme cheese. 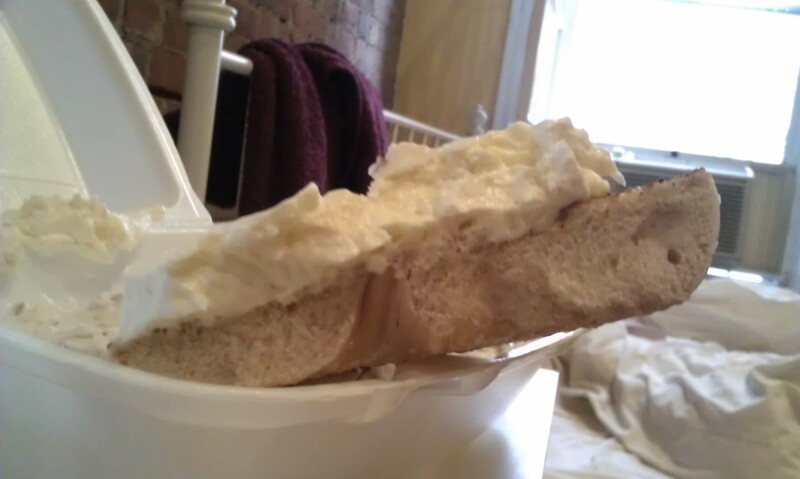 They put way too much of the cream on, the layer was as thick as the actual bagel, but that doesn’t matter in the end. Plain creme cheese tasted like heaven. Banana Nuts was interesting but I kind of took over the blueberry flavour. Mmm.. can’t wait until tomorrow. However my body is very grateful that I didn’t discover this place until one of the very last days! The worst picture but here you can see the thick layer of creme cheese!